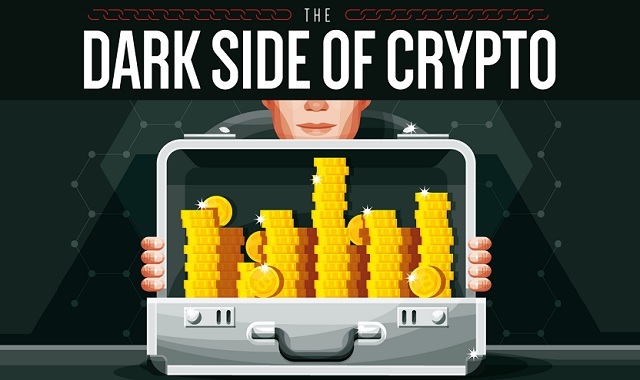 The Dark Side of Crypto #infographic ~ Visualistan '+g+"
Where money goes crime follows, and some huge illegal gains are being made thanks to the platform of crypto. With low levels of official regulation, a high priority placed on anonymity, and near virtually un-hackable, crypto appeals to cyber criminals for the same reasons it appeals to regular users. Some would consumer the early days of crypto as the golden age of crypto-based cyber crime. In 2011 when crypto was nothing more than a whisper in the media and far from a household name, the darknet was making a killing in illegal trading. Typified as the the eBay of drugs, the infamous Silk Road market was home to some of the largest listings for narcotics with a height of 13,000 listings among 1,400 vendors. Before its FBI shutdown in 2013, Silk Road had amassed a worth of $1.2 billion made mostly though bitcoin transactions. In the dark underworld of cyber crime, cryptocurrency could be considered a complacent conspirator. While there nothing illegal about crypto itself, the platform is enticing for the agenda of cyber crime. Take a look at this infographic from NullTX for more on the underworld of crypto, how criminals all over the world are taking advantage of it, and how you can protect yourself from crypto schemes.